A lipoma is a benign fatty tumor. It is the most common soft-tissue tumor. It usually presents as a fleshy nodule, typically a few centimeters in diameter but sometimes much larger. They are sometimes painful, but usually are asymptomatic. Most often lipomas are of cosmetic concern. Lipomas are often singular, but some times multiple lipomas are present, sometimes as part of an inherited condition. If there is any doubt about the diagnosis, a small biopsy is taken to confirm the diagnosis. This is done with a punch instrument. To get deep enough into the fatty tumor, a “double punch” technique is used, or an incisional biopsy is required. Typically the diagnosis is not in question, and you can proceed directly to treatment. A lipoma is most commonly confused with a sebaceous cyst. 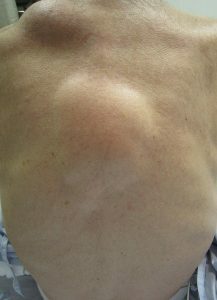 A sebaceous cyst can be differentiated from a lipoma by a central punctum overlying a cyst. Sometimes an abscess can be confused with a lipoma. An abscess is typically red and tender, and may have drainage. A liposarcoma, a form of cancer, is a rare tumor, that can also be confused with a lipoma. A biopsy is necessary for this diagnosis. How is a lipoma removed? If removal of a lipoma is desired it can usually be safely removed as an in-office procedure under local anesthesia. During the procedure your dermatologist will prepare the area will inject local anesthesia, such as lidocaine, and then carefully dissect the tumor and remove it. This can sometimes be accomplished through a relatively small incision. It is important to remove the entire capsule to prevent recurrence. Once the lipoma is removed, the skin is sutured. The sutures are usually removed in 1 to 2 weeks, depending on the location. Liposuction is sometimes used to remove lipomas as well. This is most suitable for larger lipomas, as small lipomas can be successfully removed through a small excision. Injections with Kybella have also been used to dissolve lipomas.